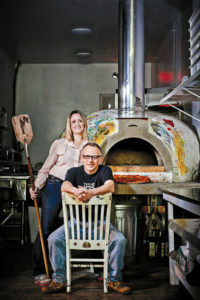 Yaquis is a family-owned restaurant opened by former school teacher Francis Rodriquez and his partner Beckie Lewis. Rodriquez, a Roosevelt alum, grew up in the neighborhood, selling newspapers with his brothers on Cherokee Street by walking in and out of the taverns. He has now returned to Cherokee from the suburbs, rehabbing this beautiful building into a stunning restaurant with his residence upstairs. They are proud parents of a beautiful baby daughter, Cher.